Preheat oven to 400° F. Grease a 12-cup muffin pan or insert paper liners. Sift dry ingredients into a bowl. In another bowl or a measuring cup, whisk together the buttermilk, oil, eggs, vanilla, and lemon zest. Fold buttermilk mixture into flour mixture. Gently fold in blueberries. Batter should be a bit lumpy so don’t over-mix. Divide batter evenly between muffin cups. Bake for about 20 minutes. For glaze, combine powdered sugar & lemon juice. Let muffins cool for 5 minutes and brush glaze on warm muffin tops. No buttermilk? No whole wheat pastry flour? See Substitutions in my blog. 37 Comments on "Lemon Blueberry Muffins"
Ran to the store to pick up what ingredients that i needed to make this and saw the fresh blueberry muffins and ate them, maybe next week. I’m so weak!!!! Just made a half batch (onesie household) — not only so scrumptious –these muffies are Beautiful!! *Small tip to the eggless-baking types; I used Bob’s Red Mill “Egg Replacer” (a powder, just add water), and these lemon blueberry muffins rose high and light. Also, made the half whole-wheat pastry flour version — and used lemon yogurt mixed with whole milk as a substitute for buttermilk. Will buy some dry buttermilk for future batches. I used Unsweetened Almond Milk! AMAZING!! Running to the grocery store to buy buttermilk but excited to tackle another one of your recipes Jenny!! Buy a can of dry buttermilk and keep it on your shelf. That way buttermilk is always on hand. 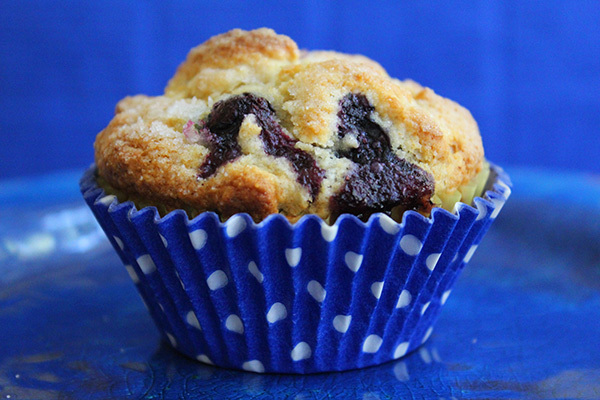 Hi Jenny, I love these muffins and have made them several times. I was wondering if I could bake them in two mini loaf pans? Let me k ow what you think. I have made several of your recipes and love when new ones are posted! Thanks for sharing all your recipes with us!! I was thinking same thing Karen! I don’t see why not … just adjust your cooking time probably to 45 mins?? I just popped them in the oven. Made them exactly as the recipe said to make them. I love your recipes. They aren’t loaded with butter and the oil makes everything quite tasty. 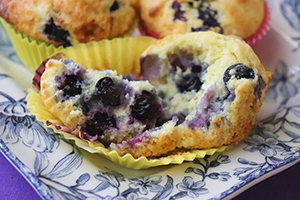 Today I had blueberries I wanted to use and I started looking at recipes and all of a sudden I thought ‘check out Jenny Can Cook I bet she has a recipe for Blueberry Muffins’. Sure enough. Thanks again. BTW I’m once again thinking about your Oven BBQ Ribs. I am inviting the kids over for dinner next time I fix them. Thank you for the great recipes Jenny. May I know what is whole wheat pastry flour? Thank you! I have a packet of frozen blueberries – do you think they would work in this recipe? Can I replace the butter milk to sour cream? Cos i can’t get butter milk here. If I using store bought butter milk, leftover butter milk must keep in refrigerator or freezer? Can keep in how long and defrost at fridge or at room temperature? You can keep buttermilk for about a month in the refrigerator. Otherwise, it freezes well. It’s a good idea to freeze it in 1-cup portions and then thaw it in the refrigerator overnight. Then to re-use it just stir it up first. I saw many comments say butter milk is make from real butter.. What do you think? So, the substitute butter milk is 1 cup of milk+ 1 teaspoon of vinegar or lemon juice right? Isn’t safe to make food? All of these recipes look fantastic. Only issue is I’m British..so have no idea about the amount you talk about when you are saying ‘cups’ do you know what weight this would be in grams etc? I am also thinking of making these without the blueberries and adding poppy seed instead. Do you think this will work? I never expected so many international visitors but I put a metric conversion chart in my blog to help with ingredients: https://www.jennycancook.com/category/a-metric-conversion-chart/ As for using poppy seeds, it sounds like it would work. Jenny, i have a few questions to ask you, can I use sunflower oil for this recipe and other recipes? Can replace the baking soda to baking powder? Baking soda isn’t necessary must discard after one month opening, can continue using after one month? My muffin pan only have six, so must i reduce the temperature and timing? Sunflower oil can be used to replace any oil in my recipes. Baking powder can not be substituted for baking soda as they have different functions. Baking soda reacts with acid ingredients to give a lift to baked goods. Baking soda should have a one to three-year expiration so it does not make sense to discard after one month. And with a 12-cup or 6-cup muffin pan, the time and temperature would stay the same. Hi Jenny can I subsitute saskatoon berries for the blueberries? I had to look them up and it appears that Saskatoon berries can be used to replace blueberries in many recipes so they should be good in muffins too. The reason buttermilk is so good for baking is its acidic nature, which makes muffins and pancakes light and fluffy. You could try to make your own buttermilk with lactose-free milk. If you google lactose free buttermilk and you’ll find some recipes for making your own using either lemon juice or vinegar. I hope that works. Can I just pour the batter into separate cups like cupcake? The same result right? I always bake cupcakes and muffins in the same pan but if you have individual cups, you can bake these muffins in them as long as you have twelve. If you have less cups, you may have to increase the baking time. Just a note: muffins and cupcakes are very different. Cupcakes and more light and cakey and muffins are more like a quick bread. So don’t expect this batter to result in light and fluffy cupcakes. You would need a different recipe for that. This recipe was AMAZING, I had used self rising flour so it subtracted a few ingredients and substituted the blueberries for apples covered with cinnamon. It came out really good :0) with the help of your awesome recipe! What do I use in place of whole wheat pastry flour? I know that can be hard to get. If you use regular whole wheat flour the muffins may be too dry and tough. In that case, just use all purpose flour for the whole recipe. what if I dont have wheat pastry flour? Should I replace it with all purpose flour 1 cup too? You can replace the one cup of whole wheat pastry flour with one cup of all purpose flour. This means you would use a total of 2 1/2 cups of all purpose flour for the whole recipe.